This monograph, the result of intensive field work, is a revised version of the author’s habilitation thesis with the same title. Dealing with relations between ethnic groups and their position within a nation state, this publication has at its centre the Fulani people. It gives a broad overview of their origins, retraces their paths of migration and compares their forms of interaction with other peoples across time and in different geographical settings. Further topics of this study are recent conflicts between farmers and Fulani nomads and problems in development policies regarding the Fulani. 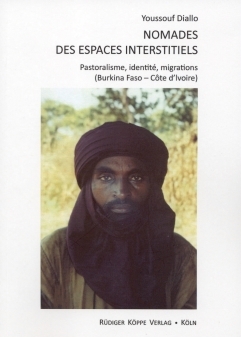 With Nomades des Espaces Interstitiels Diallo focuses not only on local dynamics in two West African countries, but also puts them into a regional context. PD Dr. Youssouf Diallo, born in Burkina Faso, studied sociology and social anthropology in Ouagadougou, Strasbourg and Paris. Involved in the postgraduate program Market, State and Ethnicity at the University of Bielefeld / Germany (1993–1995), he taught there at the Sociology of Development Research Centre and conducted research in Burkina Faso, Mali and Côte d’Ivoire (1995–1999). From 1999 onwards, Youssouf Diallo is a Senior Researcher at the Max Planck Institute for Social Anthropology (Halle/Saale). In 2004 he finished his habilitation thesis in social anthropology and has since been a private lecturer at the Institute of Ethnology, University of Leipzig. L’ouvrage comporte plusieurs originalités par son approche. Alors que les grandes études anthropologiques des Peuls sont souvent focalisées sur de petits groupes (même si leurs espaces de parcours sont relativement étendus), l’étude de Diallo embrasse une vaste partie de l’Afrique de l’Ouest [...] Dans une ambition comparative affirmée dès l’avant-propos, les analyses historiques et anthropologiques concernent des situations diverses qui sont présentées comme en un va-et-vient. [...] Surtout, l’étude ne porte pas spécifiquement sur les Peuls ni les pasteurs mais sur leurs inter-relations et interdépendances avec les populations voisines. [...] Une troisième originalité de l’approche de Diallo tient à son intérêt pour le développement pastoral. [...] l’ouvrage est susceptible d’intéresser d’autres lecteurs que des anthropologues : pastoralistes, géographes, économistes, politologues.